The HX400V's 50x zoom is only to be outdone by its little brother, the H400, which is a 63x zoom beast. Sony has introduced new compact cameras into its high zoom travel and bridge ranges, including one camera which features a huge 63x optical zoom. First up is the HX400V which will be the company's flagship bridge camera model. It features a 20.4 million pixel Exmor R CMOS sensor along with a Bionz X processor, the company's latest generation imaging engine. 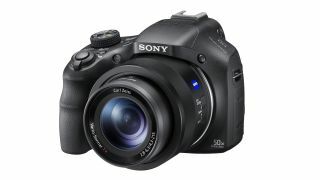 It also has a 50x optical zoom, which can be boosted up to 100x with Sony's Clear Image Zoom technology. A three inch LCD screen is joined by an electronic viewfinder, while Wi-Fi and NFC are also built-in. A camera positioned as the HX400V's little brother, the similarly named H400, is also announced today and becomes the world's longest zoom range compact camera with a 63x optical zoom lens, which is equivalent to 24.5-1550mm in 35mm terms. It also features a 20.1 million pixel sensor, but it is a CCD, rather than CMOS device. It has a three inch LCD screen, but no electronic viewfinder - there's also no inbuilt Wi-Fi and NFC, this is a camera which is very much all about the impressive zoom range. Sony is also introducing four new Cybershot models as part of its standard compact camera range, three of which feature some of Sony's latest technologies. The HX60 is a slim compact which includes a 30x optical zoom, alongside a 20.4 million pixel Exmor R CMOS sensor. The WX350 features a 20x optical zoom and a 18.2 million pixel sensor, while the WX220 has a 10x optical zoom and also an 18.2 million pixel sensor. All three of the cameras feature a Bionz X processor, Sony's latest, Full HD video recording, Advanced Optical Steadyshot and inbuilt Wi-Fi and NFC. Finally, the W800, billed as a "party camera" features a 5x optical zoom lens and a Super HAD CCD 20.1 million pixel sensor. The Sony HX400V price will be £420, the Sony WX350 price will be £260, the Sony HX60 price will be £330, while the HX60V, a version of the camera with GPS functionality, will be £340.